I urge that petitions, prayers, requests, and thanksgivings be offered to God for all people. But we now as a community we find ourselves being challenged once again. The number of people from St Paul’s community, as well as friends and relatives, who are enduring serious illness at this moment and having radical surgery and treatment, far exceeds anything we have experienced in the past. Over the last few weeks we have received message after message telling us that someone has fallen ill and requires serious treatment. Questions starting with "Why" or "What is causing this" are the focus of conversations. Statements are being made that reflect the fact that we never know what tomorrow will bring, that our bodies are temporary and weak and mortal and that any of us can face similar circumstances as those who are not here this morning because they are in a hospital bed or at home suffering the after effects of radical treatment. This sermon doesn’t give us the time to even begin to answer all the questions that are swirling around in our minds or deal with the helplessness we are feeling as we wonder whether we will be the next case to be diagnosed. In spite of the things that have happened we know that God has not abandoned us, or that he has stopped loving us, or that he has sent these things as punishment for a particular sin. That’s not the way God operates. We can confidently say with the psalmist, "Whoever goes to the Lord for safety can say to him, ‘You are my defender and protector. You are my God; in you I trust’. He will cover you with his wings; you will be safe in his care; his faithfulness will protect and defend you" (Psalm 91:2-4). We know we can trust God's love and care for us and for those who are suffering illness so the issue in front of us is not whether God loves us or not but rather the question is how we deal with this as a community and what we can do in the face of so much trouble. Let me start with Paul’s words, "Help carry one another's burdens, and in this way you will obey the law of Christ" namely, to love one another as Christ has loved us (Galatians 6:2). Paul is encouraging us to be bearers of one another’s pain. We are to take up our neighbour’s cross in the same way that Christ took up our cross for us and carried on his shoulders our guilt and pain. In helping one another to carry our burdens we make the load lighter; we make the burden more bearable; we encourage one another as we join together to share the load. Recall the parable of the Good Samaritan. As the Samaritan travelled along he came across a man who lay dying on the side of the road. Did he think, "I’ve got enough problems of my own?" Did he say to himself, "I’d like to do something but I don’t have time and besides what can I do to help someone in such bad shape?" We don’t know what he thought but we do know that he went out of his way to help this man in pain. He did this at a cost to himself. It cost him time to apply medication, to load him on his donkey and take him to a place he could get further care. He was willing to pay whatever it cost to get this man back on his feet again. In short, the Samaritan took on his shoulders the cross of this poor man’s suffering. When we think of this whole business about carrying one another, the poem about the footprints in the sand comes to mind. As we walk through life there are two sets of footprints in the sand, one belonging to us and the other to the Lord. It is when we are in our deepest trouble that we see only one set of footprints in the sand and we may wonder why the Lord has left us in our deepest time of need. The poem ends like this, "The Lord replied, ‘My son, my precious child. I love you and I would never leave you. During your times of trial and suffering when you see only one set of footprints it was then that I carried you.’ Jesus does that for us. When our burdens, our pain, our suffering are too much he carries us, encourages us, strengthens us. Jesus finishes the parable with "Go and do likewise". Just as the Good Samaritan made the problems of the dying man his own, we are challenged to make the burdens of others ours and help them to carry it when the load gets too heavy. Or think about the picture that comes into your mind when you hear how Jesus put a little child in the middle of the disciples and squatted down and put his arm around him and said, "Whoever welcomes this little child in my name welcomes me" (Mark 9:36-37). 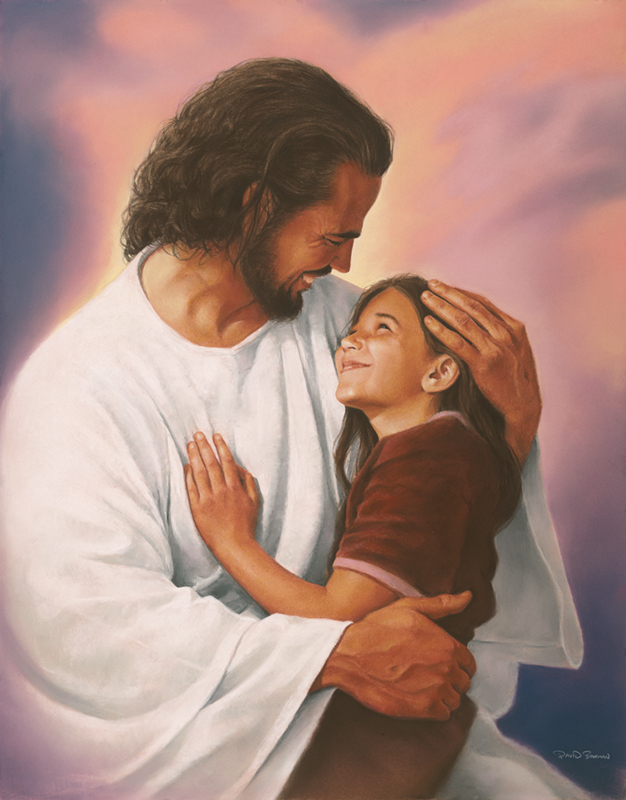 Notice the love of Jesus and the comforting and reassuring arm that he places around this little child who may well have been somewhat unsure looking up at all those strange bearded faces. Note how Jesus puts his arm around the little child, a child who is vulnerable, weak, insecure, and needing love and care. Jesus’ words encourage us to accept and take care of those who are vulnerable, frightened, insecure and needing our love and care. Grasp the significance of this for us. Everybody gets to be small like a child at some time – dependent, needy, insecure, and helpless – but the good news is this. Jesus is always there with his arm around us, and he is always there in the love that our brothers and sisters in Christ show us as they help us and make the load lighter to carry. Just as Paul challenged the Galatians to help carry one another’s burdens we are challenged at this time to help those amongst us who are suffering to carry their burdens. Paul writes in 2 Corinthians, "The Father is a merciful God, who always gives us comfort. He comforts us when we are in trouble, so that we can share that same comfort with others in trouble" (1:2-4) and he challenges the Philippians to look after one another’s interests (2:4) and have the same mind as Jesus who considered the needs of others before anything else. The comfort, carrying of burdens, encouragement, reassurance may be offered in any number of ways – a personal visit, a phone call, a note or card, providing for some kind of physical need like providing a meal or looking after children, encouraging family and friends who are also troubled by what is happening. The reading from 1 Timothy gives us another avenue of support. We read Paul’s words, "I urge that petitions, prayers, requests, and thanksgivings be offered to God for all people" (1 Tim 2:1). I know that Paul isn’t just talking about praying for those who are facing traumatic times but this is included. This is something that every Christian can do. This is something that is inexpensive and easy to do and requires few words and a little time. I recall a young man having a close shave with death after a car accident. The youth group and the whole congregation prayed for him. He recovered and when he was told how people had been praying for him he said something like, "Wow! I’ve never had anyone pray for me like that before." I can’t say that the prayers of the people changed God's mind whether to save his earthly life or not but I can say that this young man felt the love of God on his life through the love of those who were praying for him. God wants everyone to know and feel his love for them and you can bet that this young man felt loved. He felt how much people cared for him and that changed his whole attitude and he became a diligent pray-er for others so that they too could feel God's love beaming down on them through his prayers for them. Praying for others is more than just saying a few words to God and then leaving it up to him what he does with our prayer. Philip Yancey says this about praying for others. "I once envisioned intercession as bringing requests to God that God may not have thought of, then talking God into granting them. Now I see intercession as an increase in my awareness. When I pray for another person, I am praying for God to open my eyes so that I can see that person as God does, and then enter into the stream of love that God already directs toward that person." Yancey then talks about how prayer changes his attitude to those for whom he is praying. He no longer sees someone as a drug addict or an adulterer but sees past their irresponsible behaviour to a wounded desperate soul loved so deeply by his/her heavenly Father. On a personal level this has enabled me as a Christian and a pastor to sit and counsel those accused and sentenced for appalling crimes - not to judge and accuse but to see them as flawed and yet loved so dearly by their Lord and Saviour. Yancey continues, "Once I catch a glimpse of another person through the eyes of God, I feel a prod to respond as part of Christ’s body – God's incarnate presence – on earth. … I write to my troubled friend notes of encouragement, and ask how I can help. I pray for those in other countries who work with prostitutes, prisoners and orphans, and find myself digging deeper to send financial help. Nothing spurs compassion in me like prayer." (Prayer - does it make a difference? 2006 Hodder & Stoughton, pages 296-297). Or as someone bluntly said, "When you pray, expect to be part of God’s answer". Dietrich Bonhoeffer wrote, "Christ stands between us, and we can only get into touch with our neighbour through him". In other words, I as the one who is praying and the person for whom I offer petitions to God are surrounded by the same love. It is because of this love that Christ has for both of us that I can’t do anything else but be drawn by the love of Christ to do whatever I can for that person for whom I am praying. It is this love that is at the centre of our prayers and urges us to see that God's answer is one that is given out of love even though it might not agree with our idea of what is the best answer. Let me go back to our present situation where we have an unprecedented number of people seriously ill at this time. Jesus asks that we bang on the door of heaven unafraid of praying the wrong prayer or asking for the wrong thing. God knows the person for whom we are praying and God loves that person and he will supply the best answer possible. When we pray we are asking God to help us to know God's will and his love for the person for whom we are praying and to trust that God's love will always and only do what is for our best. I don’t presume to know how God will answer our prayers for these people. I don’t want to change God's mind even if I could. But I do know that through the love he shown us through his Son, he will answer in the most loving way possible, even if means that some of our dear friends will leave us. God's answer maybe his call to them to be with him in heaven. May God grant those who are suffering and their loved ones and us who are praying for them, the peace that surpasses all understanding; the peace that comes from knowing that God's love is in control and nothing is able to separate us from that love. We are like a small child in the arms of a loving Father.